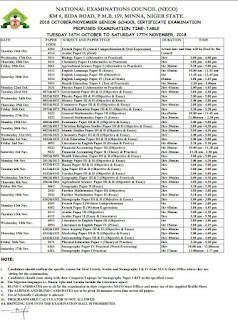 The registration for the 2018 NECO (Nov/Dec) examination, commonly referred to as NECO GCE, is ongoing, and the timetable for the examination is out. Here are some key points you have to note while registering and preparing for this examination. 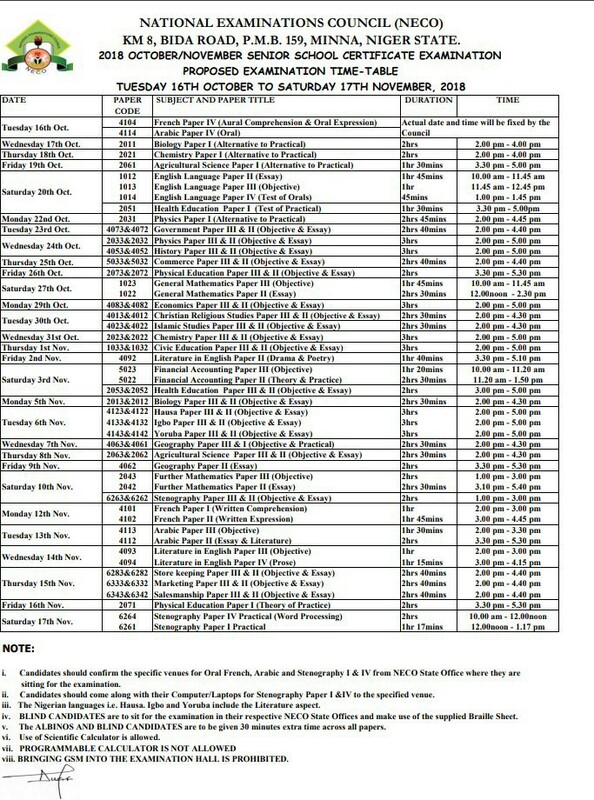 You will also find the timetable for the 2018 NECO GCE in this article. The Registration fee is Eleven Thousand Three Hundred and Fifty Naira (N11,350) only, excluding Fifty Naira (N50) Stamp Duty. All payment should be into NECO Treasury Single Account (TSA) SSCE (E) through the NECO website. Registration period begins on Monday 16th July and ends on Tuesday, 9th October, 2018 at 12.00 midnight. As earlier mentioned, registration is strictly on-line and biometric data capture is an integral part. The use of reputable Cyber cafes with good facilities is highly recommended as the Council will not be liable for registration errors committed by candidates. List of accredited Cyber cafes Nationwide where candidates can register is available on the NECO website –www.mynecoexams.com. You are to download list of accredited Cyber cafes of your State and paste it conspicuously on your Notice Board. NOTE: Candidates are no longer required to stamp or submit their attestation/photo cards in NECO state offices. a clear copy of the downloaded attestation/photo card, duly signed and stamped by an eligible referee should be presented during the examination. Please, note that the Albinos and Blind Candidates are to be given 30 minutes extra time across all papers. 1. Candidates should confirm the specific Venues for Oral French, Arabic and Stenography I & IV from NECO State Office where they are sitting for the examination. 2. Candidates should come along with their Computers/Laptops for Stenography Paper I & IV to the specified venue. 3. The Nigerian languages i.e. Hausa. Igbo and Yoruba include the Literature aspect. 4. Possession of GSM in examination hall is prohibited. 5. The use of programmable calculator is not allowed. 6. Blind candidates are to sit for the examination in their respective NECO state offices and make use of the supplied braille sheet. 7. The albinos and blind candidates are to be given 30 minutes extra time across all papers.